Accessorize your ears with these fun squirrel and nut earbud headphones! Compatible with any device with a standard 3.5mm headphone socket such as smartphones, MP3 players, tablets, portable gaming systems, laptop computers and more. Includes 2 sets of silicone tips, standard for adult and small for children 6 and older. The squirrel and nut headphones make a perect gift, or as a gift to yourself that will be a great conversation starter. Great stocking stuffer gift, birthday gift for kids, or a unique gift for the hard to shop for friend or relative. 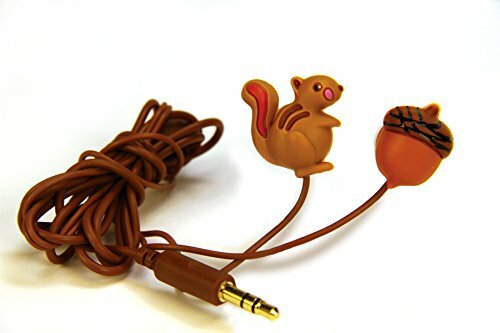 Cute squirrel and nut design with brown headphones cord - get them before they go in hibernation! If you have any questions about this product by DCI, contact us by completing and submitting the form below. If you are looking for a specif part number, please include it with your message.